Formerly referred to as the “Cupid’s bow”, the Victoria War Memorial is a must-see Chennai attraction for more reasons than one. It was essential constructed as an ode to the victory of the Allied Armies during World War I (1914–1918). 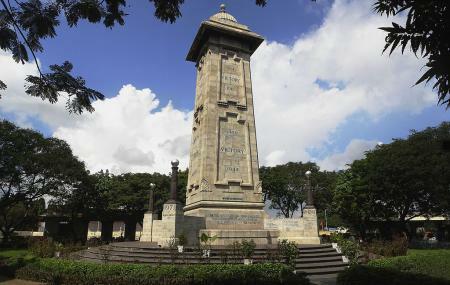 It subsequently went on to being the victory war memorial for World War II (1939–1945). Today in all, it acts a memorial to the aforementioned wars along with 1948 Kashmir Aggression, 1962 War with China and the Indo-Pakistan War. How popular is Victory War Memorial? People normally club together Thousand Lights Mosque and Alsa Mall while planning their visit to Victory War Memorial. Great and Strategic Location. Tall flag mast with our national flag bring patriotism at sight. Actually, it is a roundabout road helping to drive across different directions. Oh WooW one more beauty of Worldwar second even today it is mainted by Indian army proud of them. Well groomed and flags are being hoisted regularly. It was pretty much good.Victory War Memorial is located to the South of Fort St. George where the Flag Staff Road meets the Beach Road adjacent to the Island Ground. A solemn place in Memory Martyrsthose who laid down their lives in the WWI and WWII. Later the Names of those Martyrs who fought the 1948, 1962, 1965, 1971 and Kargil Wars were added. There is a Large Tri-colour Flag of India which inspires the visitors to salute the Armed Forces and Para Military Forces for their selfless service to the Nation. The intensity is at the peak when you stand at the Tower for a few minutes with moist eyes. But the problem at present is that it is not accessible now. The people around hardly help through guiding which way to go. Own Google map is the only solution.